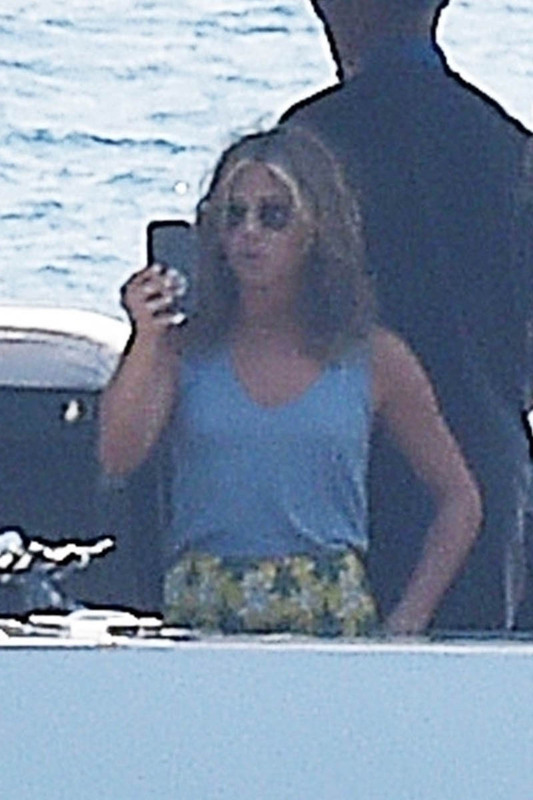 Beyoncé just spent a week on a yacht in Italy. 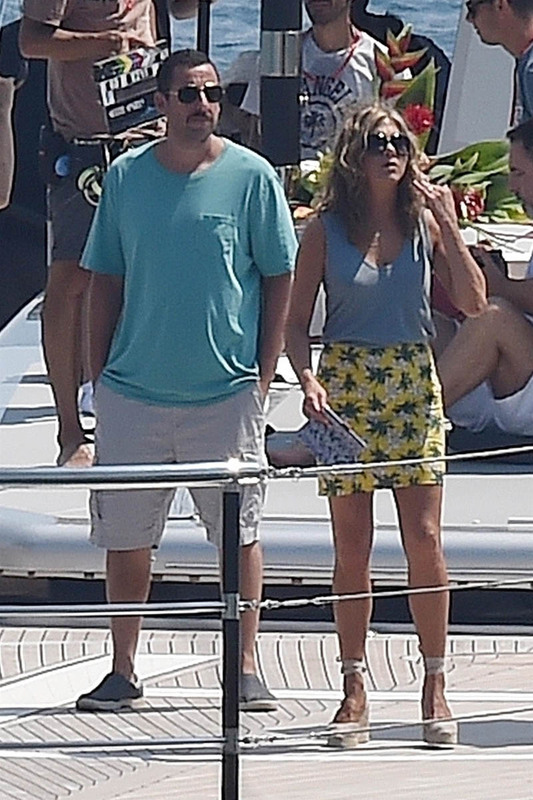 Now it’s Jennifer Aniston, in a different part of Italy, but also on a boat, shooting Murder Mystery with Adam Sandler. She was also seen out in the sun earlier this week enjoying a couple of days off before resuming production. I have a question about Adam Sandler’s costume. Is he wearing one? What is the difference between his real life clothing and his movie clothing? To me there doesn’t seem to be one. Which is fine. But now I’m wondering who these characters are. He dresses like a schlub. Like all the time. Look how lovely and presentable she is. And he’s wearing a t-shirt that could have stains on it. 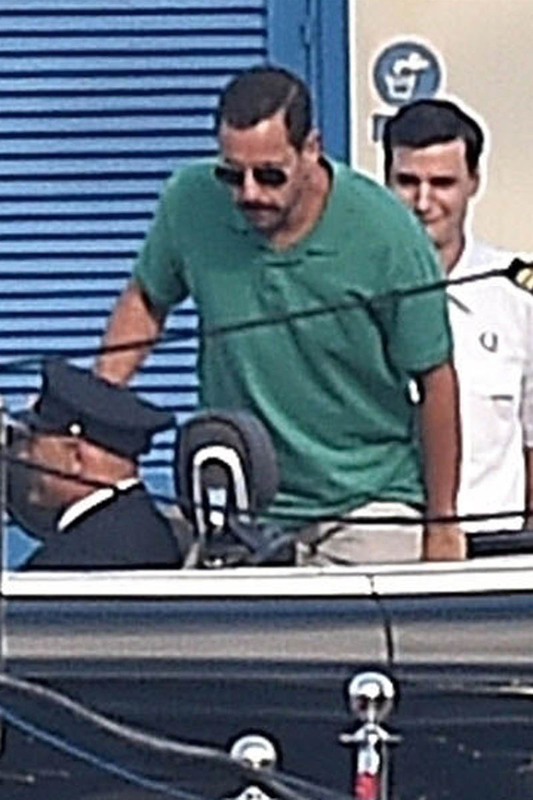 Apparently he’s playing a New York cop who goes on holiday to Europe with his wife and they get caught up in a billionaire murder investigation but he could also be playing my husband because that’s about the extent of his holiday wardrobe too. 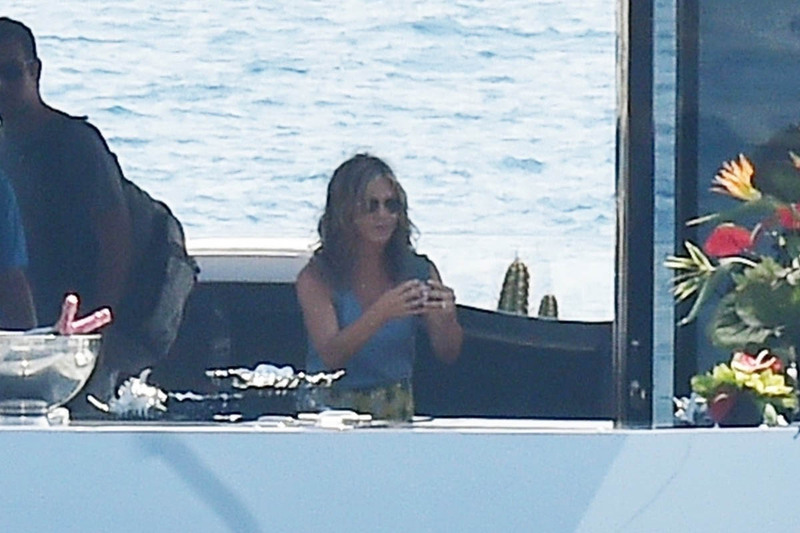 The part of Jen’s outfit I’m focusing on is her phone case. Is this her personal case? Or is it the phone case that her character would use? You can tell a lot about someone via their phone case. This is why I don’t have a phone case. I have a phone protector, which is just a plastic cover because I always drop my phone, but it’s deliberately clear and not a colour – not even black or grey or white – because I’m so weird about what I notice in people’s phone cases, I don’t want to give that away about myself. To be clear, none of these are criticisms. If you listen to our Show Your Work podcast, we talk a lot about crafting characters and the detail that goes into the whole picture. The phone case, if it is a part of Jen’s costume, was chosen specifically to match who she’s playing. That means that it was someone’s job to pick that particular case to round out this particular person. Who do you think she is?